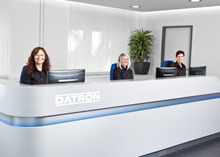 DATRON on 14 January 2015 has announced upcoming personnel changes in the Management Board and the Supervisory Board of the company. As of 30 June 2015 Matthias Reck, to date responsible for technology, will resign from the Executive Committee and specifically serve as a strategic consultant to further product development and future markets for DATRON AG. The activity profile of Mr. Reck changes in the course of personal plans and by mutual agreement with the company. The existing responsibilities of Mr. Reck will go over to Mr. Thorsten Müller, who will subsume his previous board responsibilities for Service and Production under Technology. Mr. Reck has been closely connected with DATRON since 1987 and after finishing his studies joined the company (DATRON-Electronic GmbH) in 1992. Through several stages in the research and development department he was responsible for the pioneering technology focus and technical development of economically very successful DATRON products and successfully secured numerous research projects for new products and technologies for the company in recent years. During his career at the company from 1998 he headed the Development Department and after a 3-year career at Siemens Dematic he re-joined DATRON in 2005 as Director Technology. Since May 2008 he has been Chief Technology Officer of DATRON AG and is responsible for research and development and the company’s technology center. The Management Board and the Supervisory Board of DATRON AG thank Mr. Reck for over 20 years of successful work for the company, whose development he has influenced significantly. The management team is happy to have him as a strategic consultant in the future. The near future change of the DATRON Board to a three-person team consisting of Dr. Arne Brüsch (CEO, Sales & Marketing), Michael Daniel (Finance) and Thorsten Müller (technology) continues the strategic focus on selected products and markets, that was kicked off last year, with a new lean management. This transformation is scheduled to be completed with the contractual obligation of the Board for a 5 year-team from 1 July 2015. Also on 30 June 2015, Mr. Gerhard Schulte will resign from his position as member of the DATRON Supervisory Board, of which he has been a member since the founding of the corporation. He will continue to serve the business beyond that date as a technical consultant to the Supervisory Board. Mr. Schulte founded DATRON Electronic GmbH in 1969 and managed it until passing the lead to Dr. Arne Brüsch in 2002. At the Annual General Meeting 2014 Mr. Farid El-Nomany was elected as an replacement member of the Supervisory Board in the event of Mr. Schulte’s resignation. Mr. El-Nomany, who supported DATRON in the past within consulting projects, will take up his office at the Supervisory Board on 1 July 2015. The members of the Management Board and the Supervisory Board are very much obliged to Mr. Schulte. He has shaped and supported the DATRON success since the beginning with great foresight and impressive entrepreneurial talent. The human and social values that are the pillars of the economic success of DATRON AG since the foundation of the original company 45 years ago, bear his personal signature.